Basil Twist: A Genius, With Many A String Attached The innovative puppeteer Basil Twist is the focus of a mini-festival in Washington, D.C., this spring. Performances include the underwater Symphonie Fantastique and Arias With a Twist, featuring renowned drag artist Joey Arias. Elizabeth Blair talks with Twist about his singular creations. Marionettes (and their manipulators) perform puppeteer Basil Twist's adaptation of Petrushka, backstage at the Shakespeare Theatre Company in Washington, D.C. Twist's crew sets up and warms up for Petrushka at the STC's Lansburgh Theater. The show is one of four in a Twist mini-retrospective being staged this spring. Petrushka marionettes await their entrance. As with any sophisticated exercise in puppetry, the art out front is possible only because of a certain organized chaos behind the scenes. 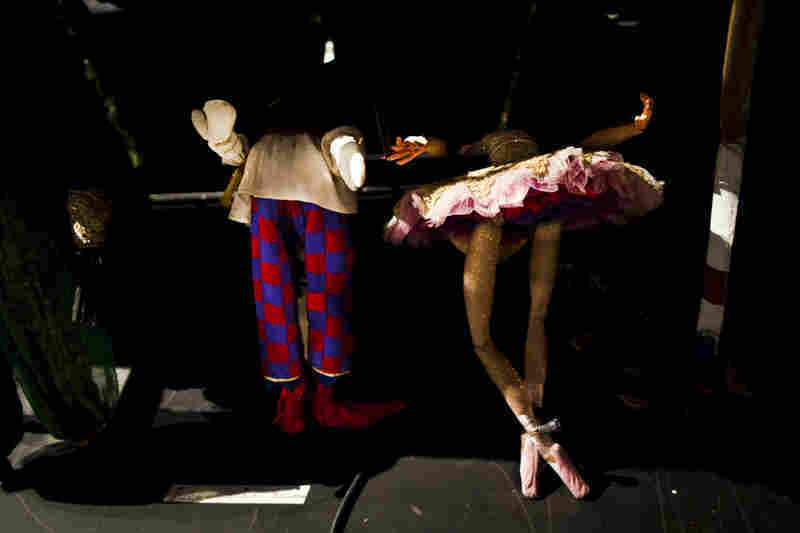 Petrushka's hero (right) is a clown puppet who falls for a ballerina puppet at a Russian carnival — but he's not the only man vying for her affections. Twist handcrafts his puppets from found materials like fabric scraps and coat hangers. 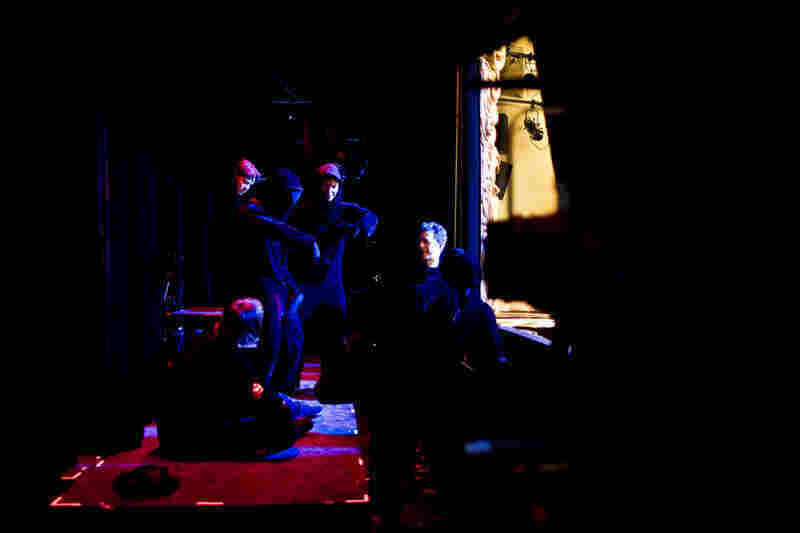 It takes three people, dressed from head to toe in black, to manipulate each puppet in Petrushka. After a matinee, puppeteers Kate Brehm, Keri Lewis and Lake Simon (with Twist) demonstrate tricks of their art to the audience. Basil Twist has been called a genius. The art he's a genius at? Puppetry — which he knows can be a hard sell. "It's not of this time," he says. "It's not of the world we live in now." But Twist, a highly trained practitioner, brings this art of the past to the present with innovative creations beyond the likes of the Muppets or their foul-mouthed cousins on Avenue Q. 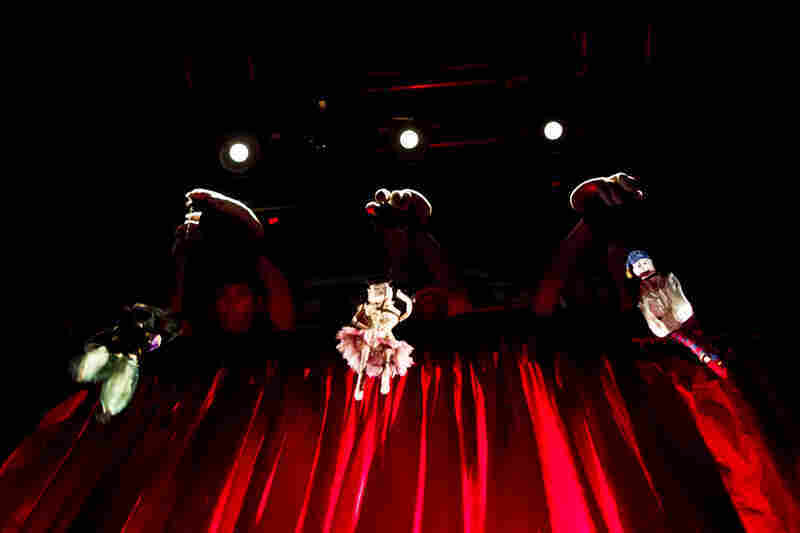 Twist's puppets are classical and contemporary, brilliantly colored and delicate, monstrous or simply enchanting. They've been featured at the Houston Grand Opera, on stage with Pink Martini and on Broadway in Pee-wee Herman and The Addams Family. And this spring, four theaters in Washington, D.C., are hosting a Basil Twist mini-festival, with productions including the underwater Symphonie Fantastique and Arias With a Twist, featuring renowned drag artist Joey Arias. And yet, Twist says, he still has to constantly explain what he does. So he carries around a simple wooden marionette he calls Stick Man in a tenor saxophone case. "People ask me, 'Oh, what is that?'" Twist says. "I just tell them it's a tenor saxophone or a clarinet, just because the puppet conversation is too involved in those moments." 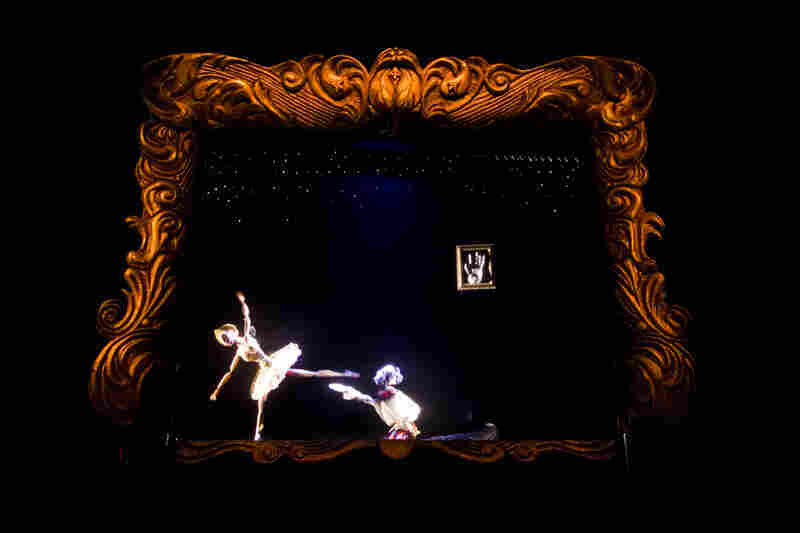 Puppeteer Basil Twist poses with Ballerina, the marionette at the center of a tragic love triangle in his adaptation of Petrushka. Twist gets a lot of questions: No, he doesn't do his own voices — Twist doesn't really use them in his work. Yes, he makes his own puppets — with just about anything he can find, including scraps and shower curtains. "One of my favorite materials is coat hangers," he says. "I love coat hangers. It's the perfect wire. ... Can't even buy this stuff." Another question Twist gets a lot: Is that your real name? "I'm actually Basil Twist III," Twist says. "My father and grandfather are also Basil Twist." Twist is also a third-generation puppeteer: His maternal grandfather was Griff Williams, a dance-band leader in the 1930s and '40s, who also used puppets as part of the act. "He had these puppets of famous band leaders," Twist says. "Paul Whiteman, Toscanini, Harry James and Cab Calloway ... and they were beautiful carved wooden puppets, worked on strings. ... At the end of an evening, when the band was playing, he would bring out these puppets." And then the puppets would lead the band. Twist's grandfather died before he was born, but at age 10, when Twist says he was already "way into puppets," his grandmother gave him his grandfather's puppets. To Basil, these antique puppets were kind of spooky, but he says he cherishes them. Twist knows so much about the history of puppetry that he often reaches back in time for his very ambitious ideas. 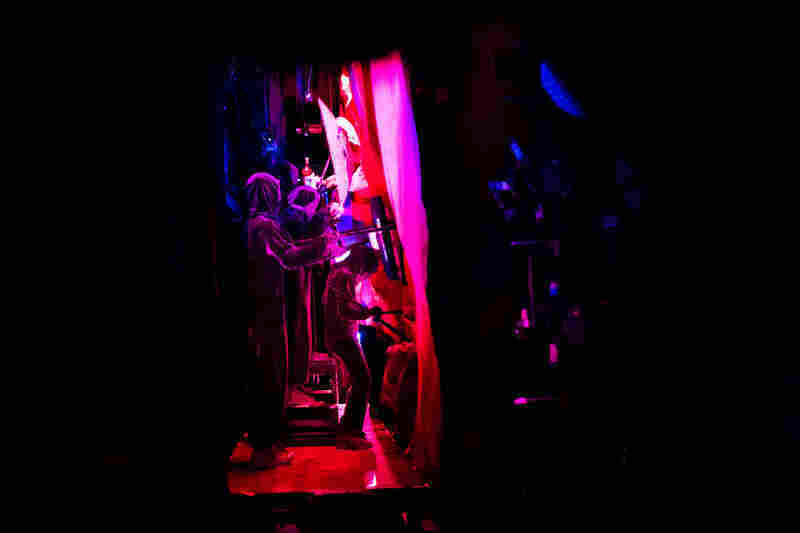 At the Shakespeare Theatre Company in Washington, D.C., nine puppeteers and three stagehands set up backstage for Twist's version of Petrushka, one of his most traditional shows. Because Twist wants his characters to leap and fight and cry and dance, it takes three people to manipulate one puppet. Some of Twist's shows have no particular story at all. He's known for creating moving, abstract images, with luminescent colors and shapes. Symphonie Fantastique is a show performed entirely underwater. "I just thought that it'd be cool to do something underwater," Twist says. "And this tank showed up on the street, where people throw stuff away." Twist now performs the piece in a giant custom-made tank that holds 1,000 gallons of water. 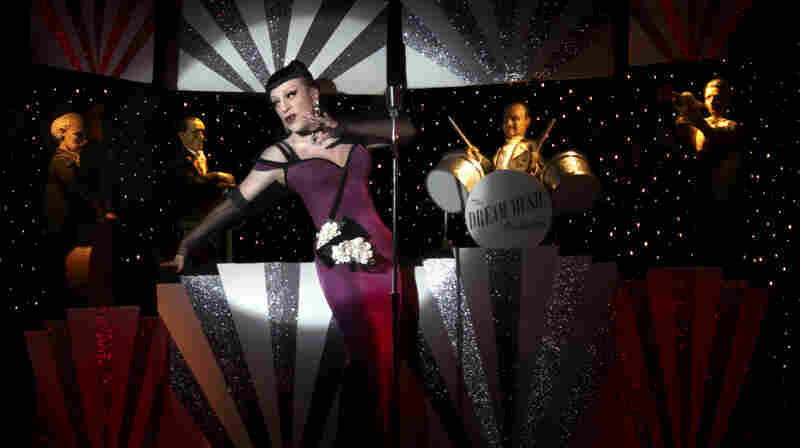 Another of Twist's off-the-wall ideas led to a collaboration with Joey Arias, a celebrated drag artist who's worked with Cirque du Soleil and made his own avant-garde theater. Arias remembers the first meeting with Twist to talk about what they might put together. Twist asked Arias, "What do you want to do?" "I said, 'How about being abducted by aliens, and an acid trip, and some Busby Berkeley piece with a giant cape and a million girls and a million legs and the fabric goes up and that whole kaleidoscope thing going on?" Arias says. The resulting collaboration — Arias With a Twist — is definitely not for kids. At one point, Arias tap dances with a line of puppet showgirls; in another, he dances with two life-sized red devils, complete with muscles and horns. And remember the antique puppets of band-leaders Twist inherited from his grandfather? Just for this show, Twist took them out of their glass case. "It was such a great thing to put my grandfather's puppets back into play," Twist says. "They don't want to be in a glass case or a box — they want to be on stage. And they want to be touring the world." As Arias puts it, what Basil Twist does is "not puppetry. It's magic."